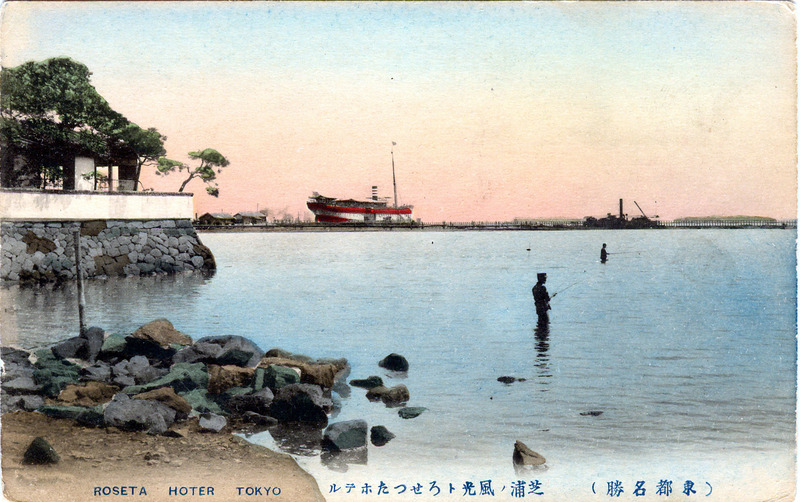 The Rosetta Hotel, berthed on Tokyo Bay near the Hama Detached Palace at Shibaura, c. 1910. Global tourism one-hundred years ago was still a recreation reserved mostly for the wealthy and, consequently, lodgings for foreigners in Tokyo were few and far between unless one was monied enough to transit in the refinements offered by the Imperial Hotel, Metropole Hotel or Seiyoken Hotel. The Rosetta Hoteru [hotel] provided ship-borne lodgings from a wharf at Shibaura near the Hama Detached Palace (on the left) on Tokyo Bay; reasonably comfortable accommodations for less-monied travelers and more budget-minded foreign businessmen. The Rosetta Hotel opened in 1907 but closed its doors in 1912. The Rosetta was originally built for the United Kingdom’s Peninsular & Oriental (P&O) shipping company, and was the first P&O ship to be built in Ireland. It was launched in May, 1880, and made its maiden voyage from Southhampton, England, in September to Australia and Bombay, India, carrying 104 first-class and 32 second-class passengers. In 1885, Rosetta was based temporarily in Hong Kong for use as an armed merchant cruiser during a time of diplomatic tension between Great Britain and Russia. In 1901, Rosetta was sold to Nippon Yusen Kabushiki-Kaisha (NYK) and renamed Rosetta Maru, before being sold again in 1901 to Toyo Kisen KK, Tokyo, and, in 1907, to the Oshiro Steamship Co.